Mountain View ranked fifth in state, but keep that a secret, OK? The latest poll was released by The Associated Press on Wednesday, and the Mountain View Thunder are No. 5 in Class 3A. “It’s awful,” Mountain View coach Adam Mathieson said. No, he is not complaining that his team should be ranked higher. He’s bummed his team is ranked at all. OK, he was kind of joking. But, if you know Mathieson, kind of serious. In other words, it is easier for Mathieson when his Thunder are not getting a lot of attention. “Big-picture wise, it’s nice to see. Union’s ranked. Hockinson’s ranked. Camas has done a good job historically,” Mathieson said. 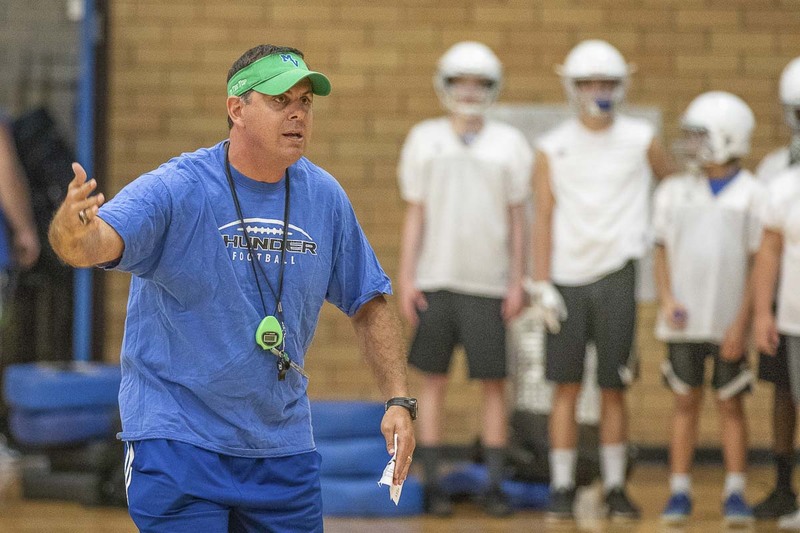 He noted that when he got to Mountain View a decade ago, there weren’t four or five teams, ranging from 4A to 2A, from Southwest Washington consistently in the rankings. “That’s a testament to the kids and coaches who have really improved the game in Southwest Washington,” he said. So, yes, it is fine to be ranked, he said. “It’s nice the people around the state are saying that we’re doing a good job here,” he said. At the same time, he does not need his players to be reminded how good they are every week. As far as Week 5, Mountain View won its fourth consecutive game, getting a big jump early in a 65-3 win over Hudson’s Bay. Mountain View’s only loss this season was a three-point game to the top-ranked Class 4A team in the state, Union. In the Bay game, Kobe Anderson made a great play on a Bay running play, forced a fumble, and it was a scoop-and-score by Justin Lufkin-Quant. A few minutes later, Andrew Gulliford had a pick-six. Mountain View only had 13 offensive plays in the first half – and had 48 points at the half. Running back Jack Mertens had 233 yards rushing and four touchdowns – and six carries. So no, the Thunder were not running up the score. It just was a combination of one of the best teams in the state going up against a team that is struggling with injuries and turnovers. The Plainsmen opened league play with a shutout, but now the schedule gets more difficult. The Plainsmen wouldn’t have it any other way when they host Kelso on Friday. “It’s an opportunity for us to say, ‘Hey, don’t leave us out of any talks,’” Evergreen coach Terry Hyde said. The “talk” is that Mountain View is the best team in the league followed by Kelso, which finished second last year, and then three other teams battling for third. Time will tell if that happens, but the Plainsmen are not willing to concede anything. Evergreen has won its past two games by a combined score of 86-12. In fact, Kelso is one of three teams from the 4A, 3A, and 2A GSHLs to be 5-0, joining Union and Hockinson. As far as Evergreen’s performance against the Trappers … sure Fort is struggling but a shutout is a shutout. The defense was solid. Isaijah Griggs had an interception and several tackles, just one of the individuals who stood out to Hyde. On offense, the coach was pleased to get varsity snaps for sophomore running back Dominic Bolds. 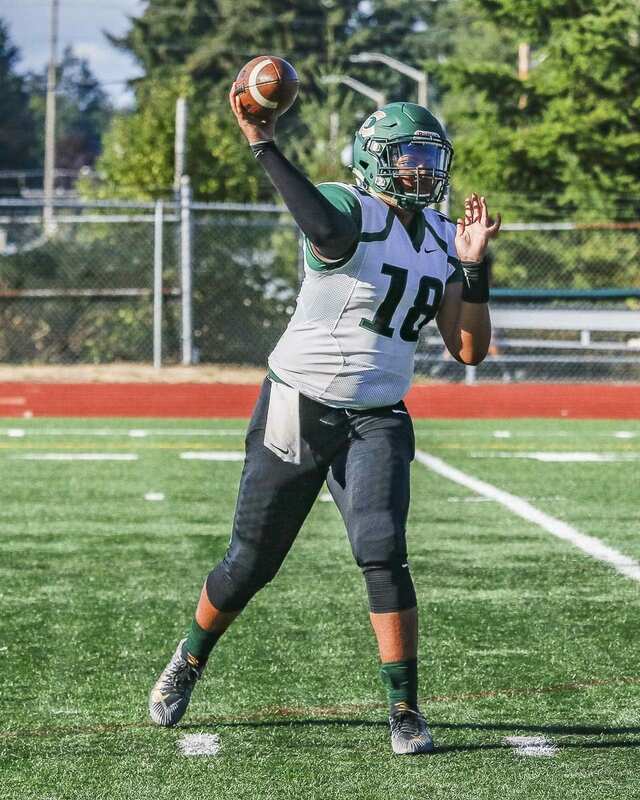 The Plainsmen went with a two-quarterback system, with starting quarterback Ryan Blaize easing back into the lineup after an injury earlier this season. Rayn Preston, who started last week, went 5 for 5 against the Trappers. In his two games, he is 16 for 18 with 3 TDs. “That quarterback rating’s not off the charts, right?” Hyde asked. The Prairie Falcons knew they had to get more physical to contend with undefeated Kelso. They ended up with a loss, but they made their coach proud. No shame in losing to Kelso, which has scored 31 or more points in all five games. Prairie’s 18 points are the most against Kelso this season. Still, it was a third loss in a row for the Falcons. Plus, they know they are facing an even tougher team in Week 6. A run like this could crush a team. That’s not happening, though. A year ago, the Eagles took the Thunder to the fourth quarter before the game was decided. This year, well Mountain View us one of the best teams in the state and the Eagles are in a growing phase. The philosophy of the Bay Way remains, though. The Eagles will return to the field Friday against rival Fort Vancouver. “We have touched base on the history of this game and the importance of our program,” Lions said of the Peace Pipe game. At the same time, the Eagles aren’t just thinking about Fort Vancouver. Another tough one for the Trappers in Week 5, and now it’s rivalry week against Hudson’s Bay. Even in defeat, though, the Trappers did impress their opponents last week. “Those Fort kids compete and do the best they can,” Evergreen coach Terry Hyde said. He noted he has a lot of respect for the players because they understand they there is not much hope for this season, in terms of winning, but they still come out every week, prepare, and compete. That has got to be tough, but the Trappers do not take out their frustrations the wrong way.